1. Murder Mystery Dinner Event - The Spy House: This house was once where the US and Soviet Union exchanged secrets of the Atomic Bomb. Now it hosts a monthly interactive dinning experience called A Brief Case of Murder. This murder mystery gets every guest involved; everyone is given a role to play in the story and some may even have a short speaking part. It it also a B&B so you may want to stay at The Spy House or you can find an Albuquerque hotel elsewhere. 2. Rainbow Ryders: Rainbow Ryders Hot Air Balloon Company, Inc. is truly a must see. They offer hot air balloon rides year round. You can either just sit back and watch as they inflate the balloon or you can find out, hands on, what its like to be part of the crew. After you soar over the beautiful landscape, you land to a champagne toast, a certificate, and a balloon pin to commemorate you safe flight. 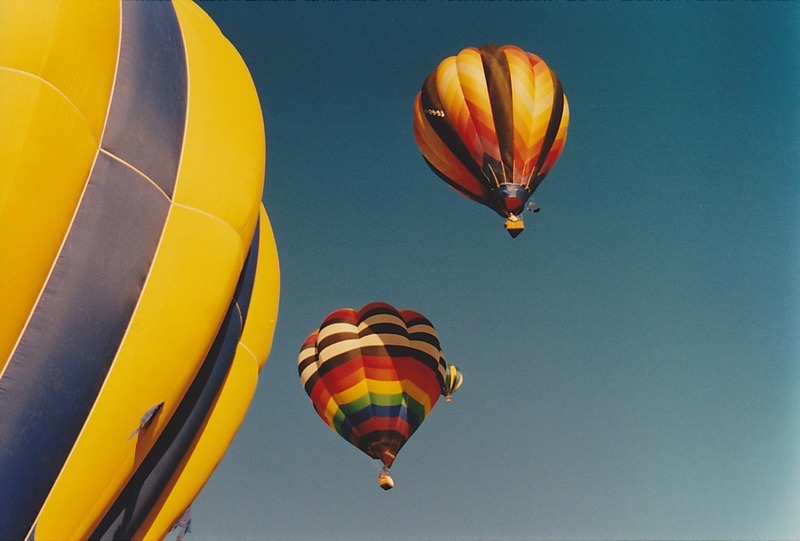 And be sure you are in town for the Albuquerque Balloon Fiesta, where 500 balloons take flight and other festivities are held. 3. Sandia Peak Tramway: Another way to see Albuquerque from the sky, this time by a2.7 mile tram ride. The Sandia Peak Tramway takes riders 10,000 feet to the peak of the Sandia Mountains for a 11,000 square foot view of the Rio Grande Valley. Make sure you find a Albuquerque hotel to stay at so you can take the tram at sunset, when they view of the land is the most spectacular. They also have skiing in the winter as well as biking in the summer. 4. Albuquerque Biological Park: This park is made up of four great attractions: a zoo, a botanical garden, an aquarium, and a beach. Of all the attractions mentioned so far, this is the most kid friendly. The zoo holds over 200 animals and has activities where you can get up close with some of the animals. The botanical garden has over one and a half miles of pathways, along with a butterfly pavilion and Japanese garden. Head over to the aquarium to see the 285,000 gallon shark tank and other exhibits. Finally, head over to Tingley Beach to fish, rent a peddle boat, and just relax. With so much to do, you may need to look into hotels in Albuquerque just so you can see it all! 5. Explora Science Center and Children's Museum of Albuquerque: This final destination is defiantly for the kiddies. This museum is almost entirely hands on. You can build puzzles, blow giant puzzles, make mechanics, and much more. There is also a good mix of activities for kids young and old. There is also an adult night every month so grown ups can explore as well. Looking for a great Albuquerque hotel so you can see all the great things Albuquerque has to offer? Look no further than the Barcelona Suites of Albuquerque, NM. With comfy beds, spacious rooms, and free breakfast, what more could you want? Visit http://barcelonasuitesabq.com/ for more information.